The consumer side of the internet may be buzzing about Nvidia's RTX 20-series consumer GPUs, but professional developers, artists, and designers have something else to get excited about today. 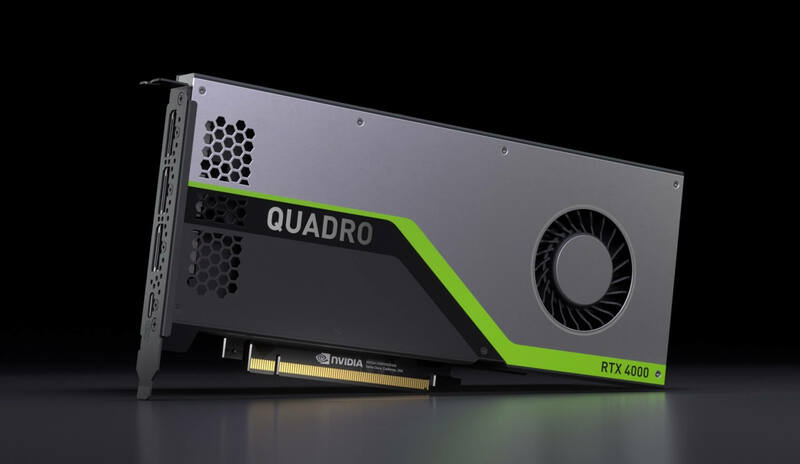 Nvidia has unveiled the Quadro RTX 4000, its first Turing-based midrange GPU geared toward workstation use. Much like its consumer cousins, the RTX 4000 puts real-time ray tracing tech at the fingertips of creators, but it aims to do so without breaking the bank. At $900, the RTX 4000 is cheaper than the rest of Nvidia's Quadro RTX cards by a significant margin. At $900, the RTX 4000 is cheaper than the rest of Nvidia's new Quadro RTX cards by a significant margin. For reference, the Quadro RTX 5000 is expected to launch with a $2,300 price tag, while the RTX 6000 is priced at $6,300. These impressive savings do come with a few performance trade-offs, though. The RTX 4000 features 2,304 CUDA Cores, 288 Tensor Cores, 36 RT Cores, and 8GB of GDDR6 VRAM. The RTX 5000, on the other hand, has 3072 CUDA Cores, 48 RT Cores, 384 Tensor Cores, and 16GB of VRAM. For ray tracing tasks, the RTX 5000 can cast up to 8 Giga Rays/second, whereas the RTX 4000 puts out 6 Giga Rays/second. If you're curious to see how these numbers translate into real world performance, you'll have to wait a bit longer. We'll likely begin seeing the RTX 4000's first benchmarks and reviews hit the web around the time it arrives on the market this December.